If you own a business, have a blog, or are a brand ambassador, you know how important it is to advertise and promote your product, services, and what you have to offer. 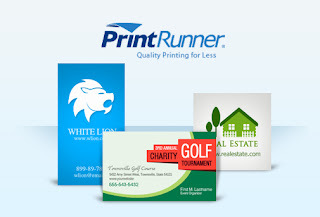 PrintRunner.com was established with little more than a small press and a dream. Ten years later their company has become one of the foremost quality printers in Southern California. Their commitment to provide the best value and high quality full color printing at affordable price made their company grow. Disclaimer: I will receive complimentary business cards from PrintRunner for the purpose of hosting this giveaway. Regardless, I only recommend products or services I use personally and/or believe will be a good fit for my readers. The views and opinions expressed on this blog are purely my own. Results may vary. No monetary compensation was received. I would love to win this for my friend's new business. I would use these for a home business. Thanks for the chance to win! I am a teacher and I would use them to put all the school contact info on them. So mad I missed this!